I don’t really remember when exactly it happened, but somewhere along the way, I stopped liking straight white sandwich bread. I don’t mean *all* white bread; I still bake with white flour when making biscuits, rolls, challah and whatnot. I mean that when it comes to specifically eating sandwiches, I will give a hard pass to white bread. I don’t even know how I ever ate white Wonder Bread at all anymore, there’s such a sour, acrid after taste to it for me now that is just…nah. These days I prefer whole grain, wheat, five seed, or oatnut flavored bread when building my epic sandwiches. I like the nutty earthy flavors in the whole wheat flour much better. Whenever a long time passes where I don’t make homemade bread, I start getting an ‘itch’. Suddenly, bread baking becomes all I think about, where my thoughts automatically start to wander, all I want to do. My taste buds suddenly crave bread more than anything else. Actually, no. That’s not one hundred percent accurate. My taste buds want and crave bread/carbs ALL the time, in general. Which is simultaneously annoying and glorious. But y’know, whatever. 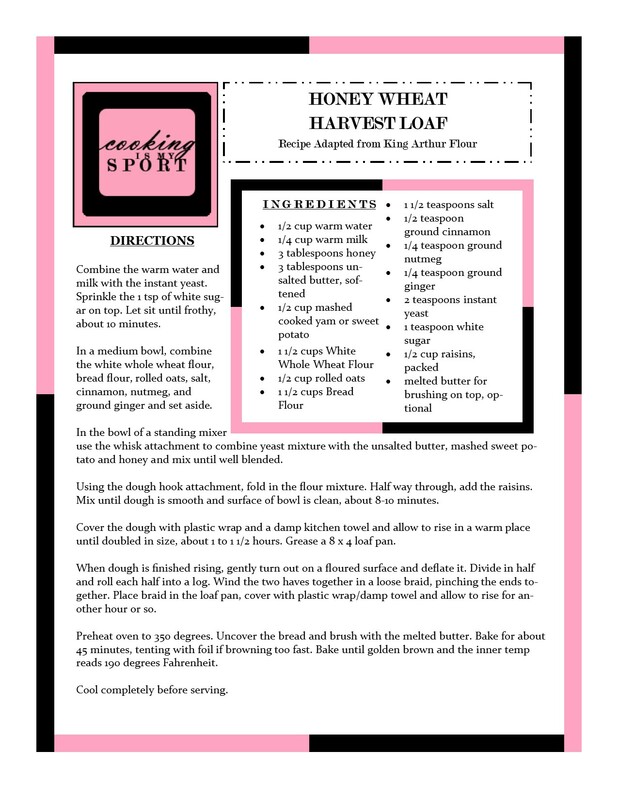 This time around to satisfy my bread baking itch, I turned to this recipe from King Arthur Flour that I’d had my eye on for a while. The original calls for it to be made in a bread machine. I don’t have one of those, but bread machine recipes aren’t that difficult to adapt to using with standing mixers, so that’s what I did here. The ingredients were all things I had on hand in the house at the time. It made a single loaf and it was all very easy to throw together. Honey wheat breads are probably my favorite, flavor-wise. There’s a perfect balance of the nutty grains with a slight sweetness from honey that just works. I will say though that breads that are based in whole wheat and bread flour (like this one) do tend to be more dense than those made with white. They’re often not light and/or fluffy; think chewy, heartier textures. Because they’re denser, they also can require longer proof times before the dough will rise. Just be patient with it because if you do it right, the results will be worth it. Apart from being made with whole wheat flour, there’s also 1/2 cup of mashed sweet potato in the dough, which is a sneaky yet tasty way to get a serving of vegetables in; y’know, just in case the angel on your shoulder is trying to make you feel guilty for eating carbs instead of a carrot stick. Not that EYE would know anything about that, I’m just trying to help you guys out. I really wish there was a way I could transmit the smells of this loaf baking in the oven to each and every one of you guys. It just smelled SO good. It took a lot of patience on my part before it was cooled down and I could cut into it. I toasted two thick slices, smeared them with some Trader Joe’s pumpkin butter, made some eggs & sausage and had myself a delicious Breakfast for Dinner. Although, this bread would work very well for french toast too, methinks. Linking this post with this week’s Fiesta Friday #162, co-hosted this week by Sarah @ Tales From The Kitchen Shed and Liz @ Spades, Spatulas, and Spoons. Combine the warm water and milk with the instant yeast. Sprinkle the 1 tsp of white sugar on top. Let sit until frothy, about 10 minutes. In a medium bowl, combine the white whole wheat flour, bread flour, rolled oats, salt, cinnamon, nutmeg, and ground ginger and set aside. In the bowl of a standing mixer use the whisk attachment to combine yeast mixture with the unsalted butter, mashed sweet potato and honey and mix until well blended. Using the dough hook attachment, fold in the flour mixture. Half way through, add the raisins. Mix until dough is smooth and surface of bowl is clean, about 8-10 minutes. Cover the dough with plastic wrap and a damp kitchen towel and allow to rise in a warm place until doubled in size, about 1 to 1 1/2 hours. Grease a 8 x 4 loaf pan. When dough is finished rising, gently turn out on a floured surface and deflate it. Divide in half and roll each half into a log. Wind the two haves together in a loose braid, pinching the ends together. Place braid in the loaf pan, cover with plastic wrap/damp towel and allow to rise for another hour or so. Preheat oven to 350 degrees. Uncover the bread and brush with the melted butter. Bake for about 45 minutes, tenting with foil if browning too fast. Bake until golden brown and the inner temp reads 190 degrees Fahrenheit. Great recipe – I too have been experimenting with bread made with sweet potato added but in the version I made it was grated raw and added to the mixture and this worked really well! Looks awesome. Gorgeous photos too! Looks gorgeous and I can’t wait to bake some up. If you would send me your jpg files I will add your great images to my post, giving you credit as the tographer in saying that I use them with your permission. I shared your recipe on CookingUpaStormWithMissPolly.com. Looks good. I’ll save this to my breads board on Pinterest. Thank you! I do hope you’ll give it a try sometime. This is making my bread loving heart do flip flops! I never liked white bread from the grocery store and thought I just didn’t like sandwiches. I love that you used wheat flour and snuck in the sweet potato too. Pinning! I’ve pinned this one, the addition of the sweet potato is inspired. I bet it smelled delicious! Thank you for bringing it to Fiesta Friday. I kept looking at that gorgeous texture and thinking this is whole wheat? And then I got to the mention of the Sweet Potato. I have a few old family recipes for Potato Bread (White) and the texture is soft and beautiful in them, too. Great job – I’m getting a whole list of breads I’d like to make – starting with that stuffed number that was featured on FF not too long ago! It really does! And it’s bread like this that makes me not miss white bread at all. Thank you!